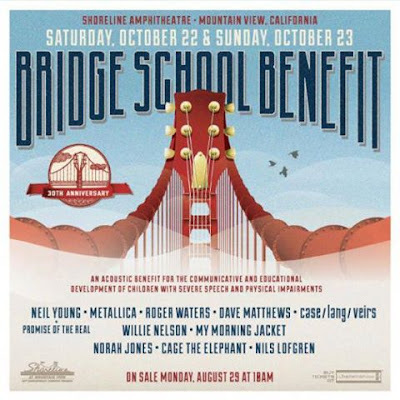 Metallica, Roger Waters and Dave Matthews are among the performers scheduled to appear at Neil Young’s 30th anniversary Bridge School Benefit Concert this fall. Headlined by Young and Promise Of The Real, the October 22-23 event at the Shoreline Amphitheater in Mountain View, CA will also see acoustic sets from My Morning Jacket, Willie Nelson, Norah Jones, Cage the Elephant, case/lang/veirs and E Street Band guitarist Nils Lofgren. Founded in 1986 by Pegi Young and Jim Forderer with help from Dr. Marilyn Buzolich, the Bridge School develops and uses advanced technologies to aid in the instruction of children with disabilities. The first benefit concert, in 1986, raised the money necessary to start the school, which opened in ’87. Due November 18, the follow-up to 2008’s “Death Magnetic” was produced by Greg Fidelman, James Hetfield and Lars Ulrich.